Below are the details of my progress with My One Meal a Day Diet. 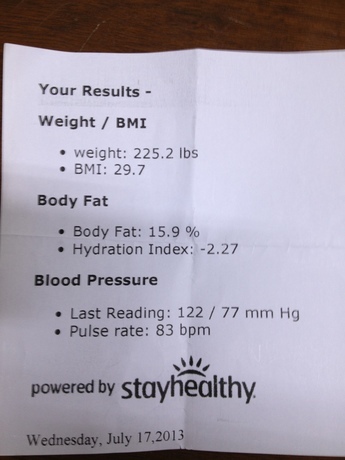 My measurements include data provided by a Stayhealthy machine I frequent at my local grocery store pharmacy, such as weight, blood pressure, pulse, and body fat %, among other things. My progress with squats is self reported, as is what I eat. If I am silent on what I eat, it is assumed I have been religiously sticking to my diet. In other words, I will report if I cheat with what I eat and will say nothing if I don't cheat. As you can see, in less than 40 days, I've gained about 4.5 lbs in muscle and I've lost about 2.5 lbs in fat. 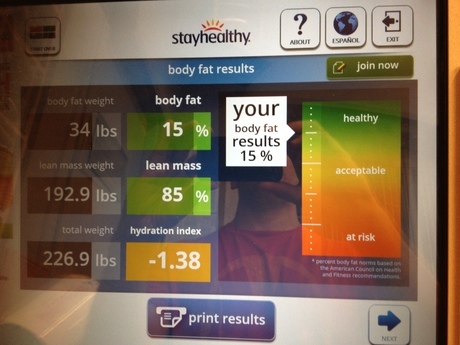 In other words, I've lost 1% body fat, by going from 16% to 15%, all while going from 225 lbs to 227 lbs in body weight. I've lost fat and gained muscle on My One Meal a Day Diet! I've gained weight while getting leaner! This is especially impressive given I am 44 years old. Caveat, I have added a variation of German Volume Training to my original workout routine. I'm also no longer doing the 20 rep squats to measure my strength progress. These are the only material changes I've made to my diet and exercise program. I'm still religiously sticking to my one meal a day. Stay tuned! Let's see what the next 40 days brings, though I'll be going to Europe for two weeks, the first half of September, and working out won't be an option.